Laughter, listening and learning — these are the three things that come flooding back to me as I look at photos from the weekend I spent at Kashi with peacebuilders from half a dozen southern states. 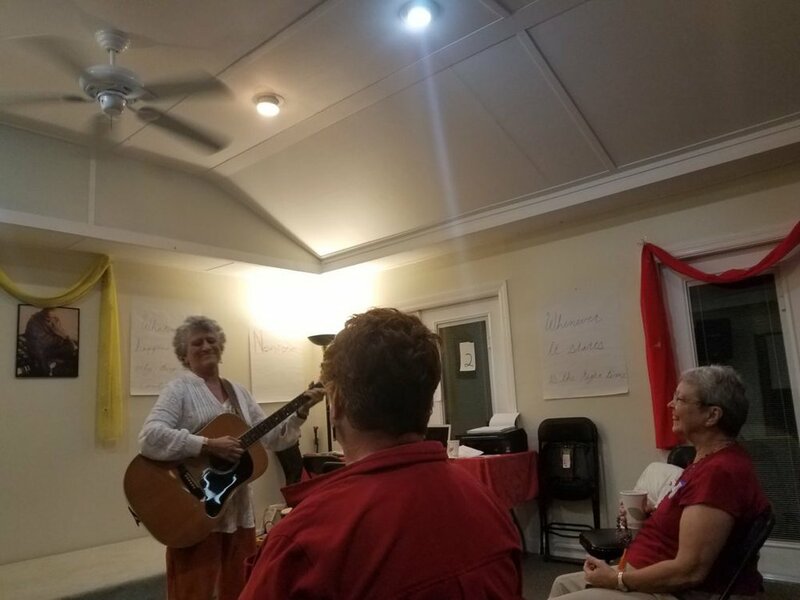 This gathering was convened by the United Religions Initiative and brought together nearly 30 grassroots activists from 12 different URI member organizations, called Cooperation Circles, and a handful of groups that were just finding out about URI. I invite you to come along as I share the story of our weekend together. As the weekend began, many of us were meeting each other for the first time. What brought us together was a shared passion for peacebuilding in the southeast United States. From the very beginning, it was clear this group of people was special. There was so much laughter, and oh was it good! It was good for our souls. It opened our hearts to one another and set the stage for an environment in which learning was meaningful — but far from boring. As serendipity would have it, the weekend also ended up being a women’s retreat. After a last-minute cancellation, all the gathering attendees were women. And, while we wish our male colleagues could have been with us, having only women brought a unique and powerful dynamic to the weekend. As peacebuilders working and living the the southeast, what do you, and we, need to sustain ourselves to continue to build bridges - for peace and joint social action - among people who have different values? What are our unique challenges? What gifts do you, and we, have to share? What touches your heart and ignites your passion for this work? Aside from the guiding questions, our agenda going into the weekend was blank. There were no sessions planned out, no presentations prepared. Instead, we sat in a circle and, using a process called Open Space, I invited every participant who felt moved to raise a question or a topic that related to our guiding questions. What started out as a stark, blank wall…. …was soon filled with questions written in colored marker. Each piece of paper taped to the wall represented a 90-minutes session where anyone who was interested could come to share wisdom, brainstorm, listen, and discuss. Questions raised included, How do you work with people/groups who have so much hate towards each other?, How do we manifest a safe place for the champions in our community to share their gifts?, and How do you deal with contentions in Cooperation Circles? After everyone who wanted to raise a topic did so, we were invited to move into the sessions that had emerged. We were also invited to do whatever we needed to in order to bring our best selves — people contributing to sessions while laying down, while standing, while eating grapes, while receiving Reiki. The environment was dynamic and alive as people who hardly knew each other – but shared passion – exchanged ideas. We learned deeply from each other during that time. And the deep learning came with a lot of deep listening. Looking back through the pictures, I see people looking intently at the person speaking, bodies leaned toward the speaker, and looks of empathy and excitement. It’s almost as if I can feel people listening to each other. During the opening night of the gathering, we shared in a candle-lighting ceremony and engaged in Appreciative Inquiry. During the retreat ate incredible vegetarian meals and dove deep into conversation. We listened to each other’s hearts, shared through stories, songs, and silence. For the closing activity, we stood in a circle and tossed a ball of yarn around, sharing words of gratitude for each other. The result was a web that connected all of us to each other – a web woven through a weekend of laughing, learning and listening together. A Book of Proceedings was compiled from the gathering, which contains notes typed up by any participants who wanted to contribute. With the agreement of everyone at the gathering, we are now proud to share these learnings with you below! We hope they help you answer questions you’ve had or, perhaps, find a new thought partner. This article was originally published on December 11, 2017 by URI.